During the Easter Rising of 1916, and the Irish War of Independence which followed, many priests ministered to the spiritual needs of those who fought for their country’s independence. These priests visited the imprisoned and condemned, dealing with their families – and captors, too. Prominent among these brave priests were the Capuchins. 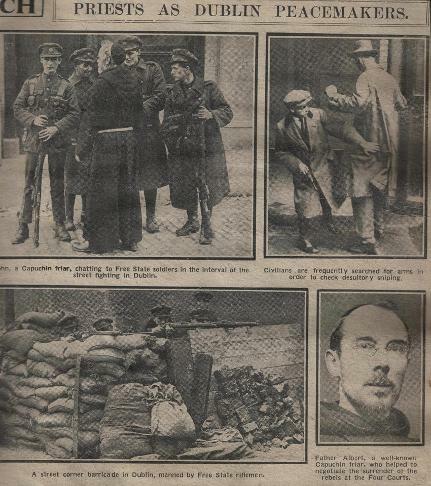 Not only during the Easter Rising but during the following War of Independence and the ensuing Irish Civil War, they continued to provide spiritual assistance to combatants, for they held that men acting in good faith and in danger of death were entitled to spiritual comfort. The bravery of the rebels is often admitted and admired today – even by those they fought. so that they, too, may be remembered. Joe Connell is a regular contributor to this website, and this book is based in part on a series of articles he has already written for us. This is Joe's first book for Kilmainham Tales, but he has written two books for other publishers and has another two in the pipeline.